Some 48 million years ago, a series of events unfolded near a deep lake in what is now Germany to bring us one of the world's most incredible fossils. First, an insect was caught and eaten by a small lizard. This would turn out to be the little reptile's last meal: it soon became lunch for a hungry snake. And before the snake had even finished digesting, it too died, its remains settling on the bottom of the lake. An insect inside a lizard inside a snake, all three buried and preserved together. Determining the diet of an ancient animal is difficult because we can't simply watch it eat. Instead, palaeontologists often turn to indirect clues. The shape and chemical structure of an animal's teeth, for example, can hint at its preferred food. Sometimes we get lucky and find more dramatic evidence like bite marks from a predator on the bones of its prey, or chunks of leftover food inside fossilised poop! These clues are very informative, but what could be better than finding a fossilised last meal still sitting in a prehistoric animal's gut? It's rare, but not unheard of. Exactly those kinds of discoveries have taught us that some small pterosaurs ate fish, that ancient birds sometimes swallowed bugs and pollen, and that baby mammoths fed on their mothers' milk and dung just like modern elephants. But three-in-one fossils? They're not just rare, they're practically non-existent. 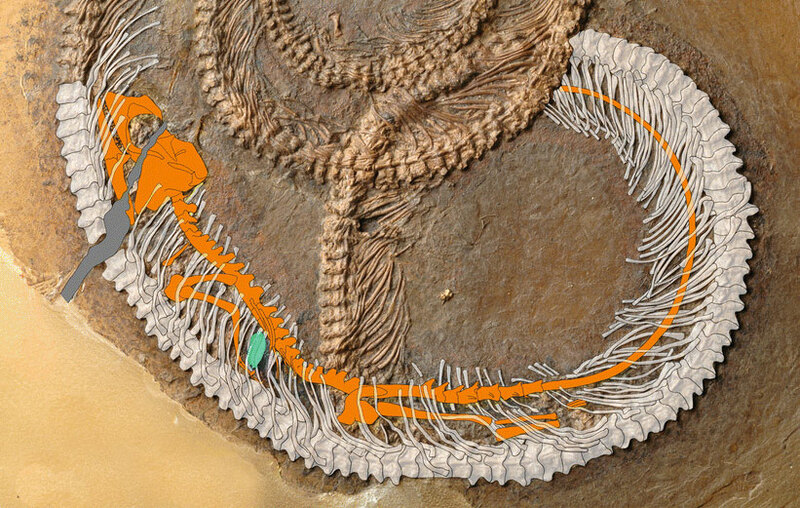 This snake-lizard-insect combo is only the second fossil ever discovered to show three levels of the food chain at once. "It's probably the kind of fossil that I will go the rest of my professional life without ever encountering again, such is the rarity of these things," said Krister Smith, who led the study of the extraordinary find. "It was pure astonishment." The snake is an ancient serpent called Palaeopython (though it's actually related to boas, not pythons), and at a metre long, it was still a youngster when it died. The lizard, only about 20cm from snout to tail, is called Geiseltaliellus. 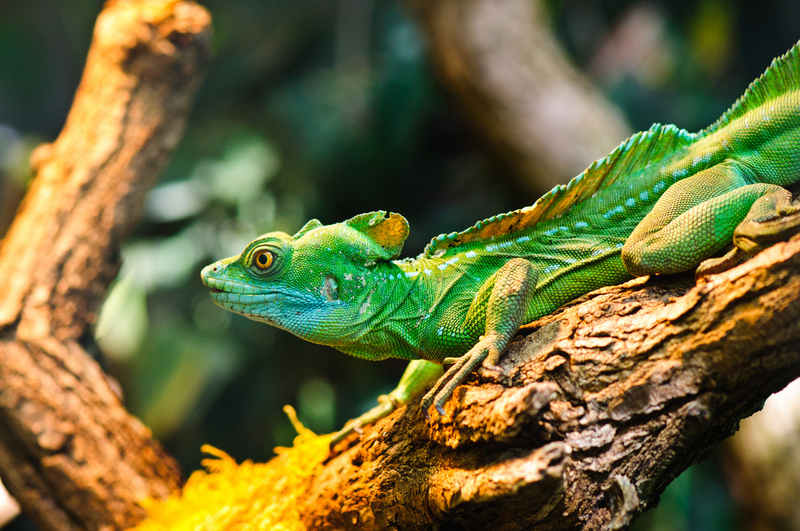 A relative of the modern-day basilisk lizards found in American rainforests, it also wasn't quite an adult yet. As for the insect … it's an unidentifiable mess of parts, reduced to chunks of shimmering exoskeleton in the lizard's belly. The fact that both reptiles were immature individuals provides clues about how their diets changed over their lifetimes. Another larger boa from the same fossil site has been discovered with crocodile remains in its belly, indicating that these snakes turned to larger prey as they grew, just like their modern relatives. And a larger fossil of Geiseltaliellus was found with plants in its stomach instead of insects, so it seems these ancient lizards, like their living basilisk cousins, became more herbivorous with age. All of this incredible information would not have been preserved in most fossil sites, but these bones were found in the Messel Pit, a famous fossil locality and a UNESCO World Heritage site near the city of Darmstadt. The Messel sediments formed in an ancient volcanic lake, and they host some of the world's best-preserved fossils, including rare and delicate specimens of bats, birds and primates. Counting this new find, the site also has some of the world's only fossil evidence of the diet of prehistoric lizards and snakes. Wondering about the first three-in-one rarity ever discovered? Reported in 2009 from another ancient lake over 250 million years old (that's older than the dinosaurs! 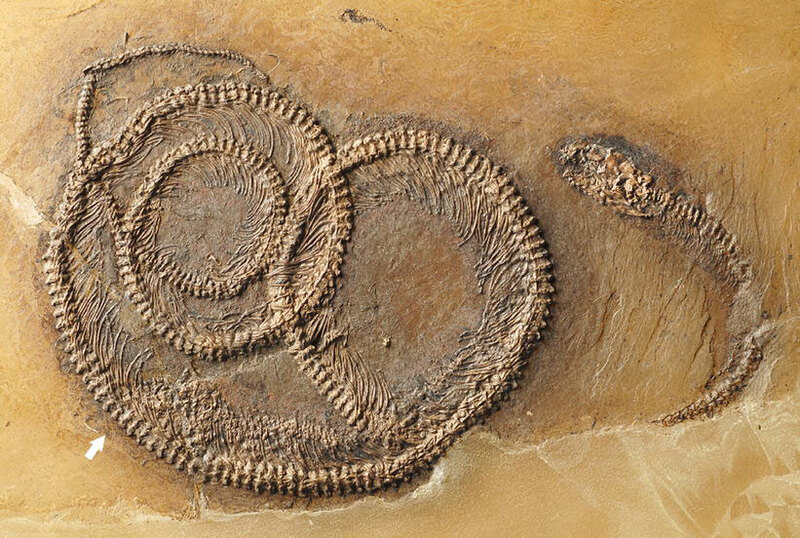 ), that fossil was a prehistoric shark whose belly held the remains of two larval amphibians, one of which had bones from a small fish in its stomach. The fossil record never ceases to amaze! Why do baby guillemots jump off cliffs before they can even fly?